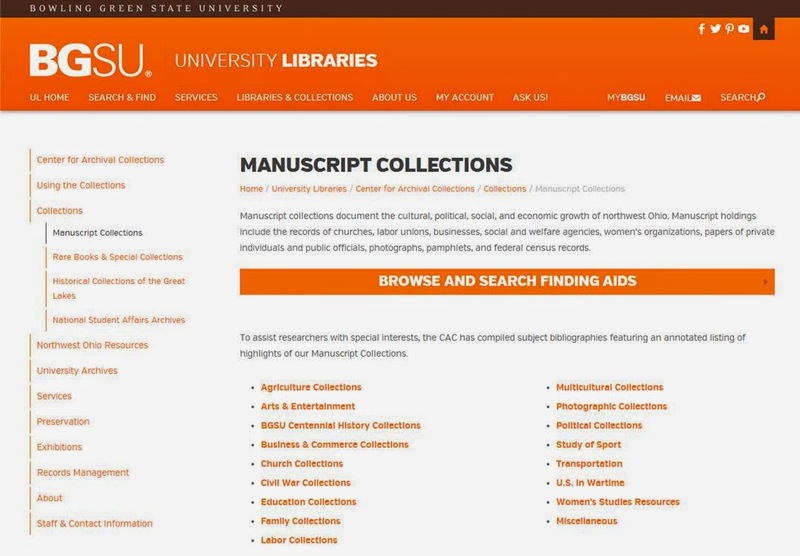 "The primary mission of the CAC [Center for Archival Collections at Bowling Green State University] is to actively acquire, preserve, and make accessible to researchers historical materials in Northwest Ohio, Historical Collections of the Great Lakes, University Archives, Rare Books & Special Collections, and the National Student Affairs Archives. Emphasis is placed on local history, Great Lakes maritime history, women's history, the Civil War, education, and all aspects of the social, cultural, economic, and industrial history of northwest Ohio. " many items of interest for Ohio and Great Lakes history. "consists of over seven hundred index cards containing such information as birth, marriage and death dates of members of the Wyandot tribe from the Upper Sandusky area. Some vital statistics date as early as 1795." "consists of approximately ten thousand index cards containing such information as birth, marriage and death dates of members of Native American tribes found in Northwest Ohio who later moved west to Oklahoma and Kansas. Vital statistics date as early as 1724. The series of cards was researched by Kenneth Smith over a period of many years. The Wyandot tribe was the first to be completed, followed by other Northwest Ohio tribes. " "1824-1881. Correspondence received by the Bureau of Indian Affairs from government agents, native peoples, and settlers dealing with the daily lives of native peoples and tribal relations with individuals and the federal government." "A collection of newspaper articles dealing with people and places of historical interest in Hancock County, Ohio. Includes recollections of meetings between native peoples and settlers and early findings at archeological sites." "Research notes compiled by Dr. Paul Kostyu for an article on Indian land claims in Adams Township, Seneca County, Ohio." "Journal, 1832. Resident of Logan County, Ohio, appointed Assistant Conductor of Indians for the removal of the Shawnee from Ohio in 1832. Photocopy of appointment letter, and typed transcription of journal, documenting the removal of the Shawnee Indians to Indian Territory in 1832." "radio scripts for a series of juvenile programs on Ohio history, co-produced by the Ohio State University Radio (WOSU) and the Ohio Historical Society." "composed of shipping documents from the Sault Ste. Marie area and nearby ports from 1802-1866. Among these documents are shipping manifests, clearance documents, bills of sale, enrolment bonds, Treasury Department circulars to custom collectors at the Port of Sault Ste. Marie and nearby ports, and personal and business correspondence...Throughout this earlier period of documentation lie significant portions of documentation that dealt with the American Fur Company. A majority of shipping manifests, from small hand- written pieces of parchment for canoe-sized craft to printed manifests for more substantial vessels, listed the cargo these ships carried for the firm.After the United States solidified control of the region after the War of 1812, a significant portion of business documentation, correspondence, and shipping documentation belong to the personal papers of three prominent individuals in the Sault Ste Marie region, Peter B. Barbeau, Myron W. Scranton, and George Johnston. The former two individuals were prominent businessmen, the latter was an Indian agent in the area and eventual governor of Michigan. The documents of Peter B. Barbeau and Myron Scranton are a useful supplement to the researcher concerned with business and economic documentation associated with Sault Ste. Marie in the nineteenth Century. The documents of George Johnston are equally useful to researchers concerned with Indian Affairs in the Lake Superior region."